- but most of all we want people to hear what we have to say...so pray that their hearts are open. Stolen Identities: Today we learned that Chris' identity has been stolen. While he was in Japan this weekend, he also appears to have been at Six Flags Great America, The Cute Kid store, TMobile, etc... We have found out that there has been fraudulent activity on two credit cards, and possibly more. 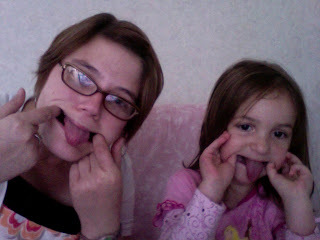 We are both actually laughing about this, because come on, how crazy that this is happening while we around the world?! But at the same time, how annoying that we have to deal with this and try to figure this out while we are around the world! 4th of July: A day to celebrate, right, so why is this a prayer request? Well, the 4th of July is my favorite holiday. My whole life I have gathered with many of you on both the 3rd and 4th of July. I was away at camp a couple of summers and missed it, but I was still able to celebrate with friends. I'm really nervous that this will be a hard weekend for me, being away from all of you and knowing the fun that I am missing. And nobody here knows what 4th of July is...there are no fireworks...and of course, no Taste of Chicago! We are going to do a little something with our team on Saturday, but with all we have to do for Sunday, it will be short. So please just pray that I don't get more homesick than necessary this weekend. As a side note, to curb my missing the 4th of July, I bought a CD today off iTunes - it was $5.99 and had 50 patriotic songs - it's wonderful and I feel like I should be sitting in Grant Park when I listen to it. Ok, I know this is long, so I will say thanks ahead of time. We have some busy days ahead! This was stated this evening after he went to the grocery store and was disappointed by their fruit selection. This week has been a hard week for me. I've been so exhausted and just haven't felt like I have any more to give. On my breaks each day I was taking naps, and I'd go to bed by 9pm each night. Emotionally this just made it a struggle for me to get through each day. We have been working so hard at teaching, plus we are getting ready for an Easter Program we are putting on for the town on July 5th. I know "Easter in July? ", but the timing works out best to have it then. Anyways, so the other night I was finishing up with class and then we had a 2 hour break or so before we had drama practice for the Easter program. So I said to Chris, let's just keep going, if I go home I'll be frustrated that I have to leave the house again. My kind and wonderful husband said, ok. So we took the 6:12pm train to Koriyama and set out to have dinner at McDonald's and dessert at Starbucks, and catch the train back home an hour later. Well, McDonald's has this sale right now "4 chicken nuggets for 100 yen ($1 dollar)", and I was so hungry by the time we got there I said I wanted to get a sandwich and some nuggets as a side. Chris said ok, so we placed our order for our sandwiches and I said and we'd like the "4 chicken nuggets for 100 yen". The lady responded and said "4 chicken nuggets, ok". Well, then she gave us 4 sauces - I thought, thats's so generous, you'd never get that many in America. So we get our number and sit down and Chris says, "I think you might have ordered 4 orders of chicken nuggets." I was like really? Maybe, but I don't think so. Well, our order came and sure enough - we had our sandwiches, fries, drinks and 4 orders of 5 chicken nuggets. So there we sat with all of our food and 20 chicken nuggets! I couldn't stop laughing, I was already so exhausted and I had just ordered so much food! No wonder think of us as the "Fat Americans"! Needless to say, we only ate 1 of the orders and brought the rest home for our friends' kids, and I still was able to get a Starbucks for dessert! Here are two Japanese videos that we like to watch these days. I think it is so cool how they are made pay attention to the background, and quite funny to watch! 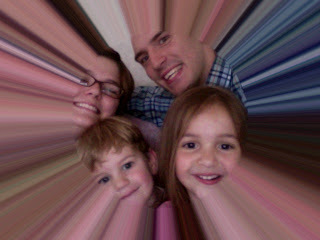 On Sunday afternoon our friends, Peter and Rebekah, called us to see if we could come over and watch 2 of their 3 kids. The kids were napping, so it was really an easy task set before us. We packed up our lunch and laptop and headed over. 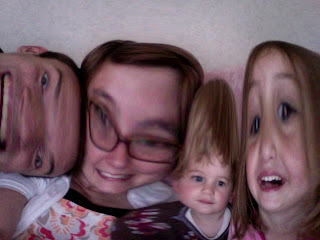 Most of the time the kids were asleep so Chris and I just sat around watching a movie, but after the kids woke up from their nap, we had some fun entertaining ourselves on Photobooth. Here's some of the fun we had! Asher woke up and joined us in the fun. He was a little groggy at first, but by the end he was all smiles! 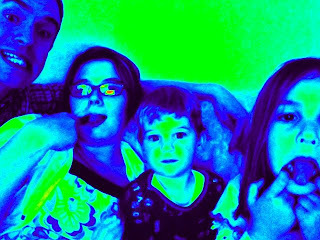 Katherine liked this one because of her blue tongue. Thanks for letting us hang out with your kids Peter and Rebekah! We love them (and you)! Last Saturday we got to spend the day with a new friend, Shizuka. Shizuka is friends with Kitty. They knew each other when they were both living down-state. As we were coming to Japan, Kitty found out that Shizuka only lived about 40 minutes from us! So Saturday we finally met her and spent the day with her. She took us to the town of Nikko, to see the Toshogu Shrine. The Shrine was so huge; there was building after building of beautiful Japanese architecture that was built in the 1600's. It was very interesting and sad at the same time to see all that had been built to worship false Gods. This is Ashley, me and Shizuka in the town of Nikko. They had a beautiful bridge and waterfall. Turns out that Ashley, who is on our team, also knew Shizuka - what a small world! The theme of the day was STAIRS - this is the first set of 100 stairs that we climbed throughout the day. We started to count at one point, but I never heard the final number. People write their prayers on these papers and tie them to the post. Reminded me of the Wailing Wall in Israel. The original hear no evil, speak no evil, see no evil monkeys. 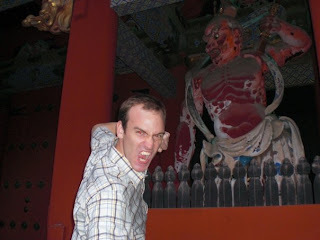 These arches are put in front of every shrine in Japan. There was lots of gold. This arch had dragons carved into it, and every dragon was different. This cat is a national monument. I think it means "good luck", but we're still not sure why it's so famous. There were HUGE trees there. We wanted to know if they were from the 1600's too. We had a great time and were excited to see a new part of Japan and make a new friend! Well, first of all, we have no trip planned for home. But the other day I said to Chris, "When we go home I have a list of places I want to go eat at, so we should start saving for them now." I know, sad that I dream of all the food I miss back home, but the food here is definitely different. So I thought I'd share my list with all of you, and tell you all to enjoy these tasty places for me this summer! 1. Lou Malnati's: We'll order the Malnati's Salad, a sausage pizza, and cookie pizza for dessert. 2. Oberweis: For some chocolate shakes! 3. The Pit: For a Cheeseburger special, with Dr. Pepper. 4. Jay's: This is Chris' choice, he wants a beef, or maybe a combo! 5. Francesca's: The best Italian food in Chicago! 6. Garcias: We may have to go more than once, I really miss Mexican food. 7. Always Thai/Spoon Thai: Either place will do, as long as I get some Pad Thai. 8. Starbucks: This goes without saying, but I'll have one-a-day, thank you! I know, sad that I could think about so much food - but I've realized that I've turned into a foodie, no thanks to my dad and Chicago! Saturday the Youchien (Preschool/Kindergarten) had their annual Father's Day program. They asked us 5 English school teachers to help in the program. Last week I found out that our part was to stand with a Japanese student for the welcome, the Japanese student would say the welcome greeting in English and we were to translate it into Japanese. It seemed kind of backwards to me, but thankfully they gave us our parts early so I could memorize mine. My line was to say "Let's have fun together!" in Japanese, "Isshonni takusan tanoshimimasho!" It went fine...but we had to do more. Not only did we have to speak in Japanese, but we had to do the Chicken Dance in front of 125 students and their dads. It was quite hilarious! And we were on a stage about 3 feet wide, so I was trying not to fall off the stage the whole time. I told Chris he had to come, because this would be great humor for him to watch. I figured he'd bring a camera, but when I looked at him standing in the back, I saw him with a video camera. I just about died. He claims he'll figure out how to get the video onto the computer and on to the blog, so if he does you'll all be in luck...but I'm hoping he can't figure it out! Here are some pictures from the day - it was a fun morning and there were LOTS of laughs! The cute little 5-year olds. Each class wears a different colored hat. This was some sort of Japanese dance to the song "Obladi, Obladah"
This game was so funny to watch. The parents put the student in the sled and ran them around a cone and back. Some of the parents would go so fast, that when they would run around the cone, the student would end up flying off the sled. Only a few students ended up in tears, most were just laughing the whole time. The gym was decorated with pictures the students painted of their dads. We have been trying some of the Japanese candy, and it's really good. One of the students' favorites seems to be the jelly. It's like jello in a plastic creamer container (you know, the creamer they have at restaurants). It doesn't refrigerated, so we sent some to some kids we know in the states, just because it's kind of funny to us. 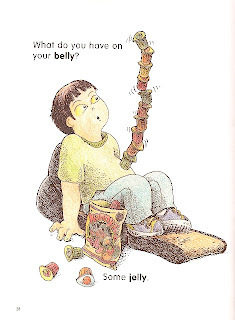 Well, yesterday we got an email from Chris' sister who checked out a book from the library and they saw this page in the book - this is really what the candy looks like! I thought it was fun so I thought I'd share it with all of you. On Sunday after church, Kawaai Sensei (she's like our team mom), invited us all to have Yakiniku for lunch. Chris and I have never had Yakiniku before...we loved it! Yakiniku is meat and vegetables that you cook griddle - like Benihana, but YOU do the cooking! It was so tasty and we even got to bring leftovers home, so we'll get to have some more later this week! One of the many plates of vegetables, before they were cooked. Chris and I had to cut up 6 cabbages in preparation for the meal. As you can see, we'd grab the food from the griddle as soon as it was ready! On Saturday I spent the day with my friend, Rebekah. We decided to head to the nearby big town, Koriyama. We spent the day walking around town, exploring, eating lunch at the Italian restaurant and of course, drinking Starbucks. The day was so fun and so refreshing! As we were walking around by the train station, all of the sudden we were in the midst of a hula show. We stopped and watch these cute little girls do a hula dance. After they were finished, three middle-aged men got on the stage and started hula-ing. It was so funny and so odd at the same time, but they were really into it. Japanese people really like the hula, and I knew that, but I didn't know that men did the hula, too! Right before we left for Japan, I decided to take a quilting class. I was able to get everything finished before I left, so my quilt could be sent off to the long-arm quilter to be "quilted". Collette from Quiltology said she would ship it to me when it was finished - and this week it arrived! The new addition to our living room. Look at the beautiful stitching! So, maybe it's just that I grew up in a diverse area, or the fact that I had been living in such a diverse area before we moved to Japan, but sometimes I forget that here in Japan I stick out like a sore thumb. I kind of just feel like I fit in here - I say hi to people as I pass them by and bow. I, for the most part, have grocery shopping figured out and can find things at the store. I am fully confident in buying a train ticket and riding the train. And, the other day I even conquered the feat of learning how to pay my bills here (you pay them in person at the grocery store). So really, I feel like I can do most normal everyday activities and not feel like I stick out too much. Everyday I walk past the Youchien (Preschool/Elementary school) and for about 50 yards away the 3 year olds will yell to me "Eigo no Sensei, Eigo no Sensei" (English teacher, English teacher), usually followed by "Hello" or "Bye-Bye". They are so cute so I, in passing, say Hello or Bye-Bye in return, and then greet the teachers in Japanese. But the other day it dawned on me, if a 3 year old can recognize that I'm an oddball from 50-yards away, I must really stick out here! Japanese isn't diverse at all - Chris and I, and our fellow teachers, are the only foreigners living in this rural town, and probably the surrounding towns too. But sometimes I just forget how much I really stick out. So then in thinking about that, it dawned on me even more, that being here, and realizing that everyone is watching me, my actions are not only a reflection on myself, but on my teammates, on the Japanese family that has invited us to join them here, and most importantly on the example of Jesus that I am trying to live out to and for the Japanese people I encounter here. It's ok that I'm an oddball here, people are wonderful and continuously show me grace when I don't understand something about the culture here, but I must remember everyday, that every action I take is not just about me, but is about a much bigger picture here!